Support your cause with our Athletic Dept. Sports Performance Shirt. With our creative design, you can show your support for any awareness that is near and dear to your heart. Just enter the awareness you wish to promote and we will turn it into your favorite shirt to wear at any awareness walk or charity event. This is a perfect, and versatile, awareness shirt design. 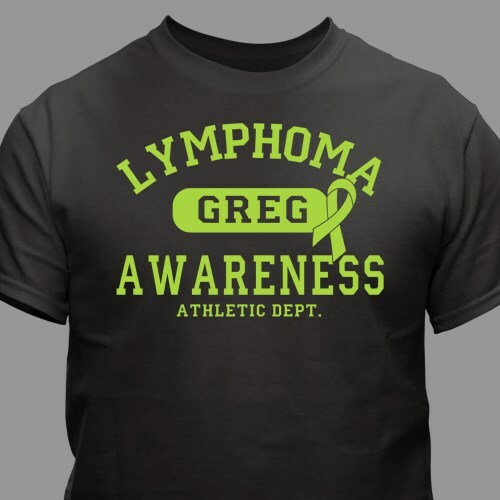 Our Awareness Athletic Dept Cancer T Shirts are available on our 100% polyester white or black, moisture-management and anti-microbial dry performance sports shirt, machine washable in adult sizes S-3XL. This shirt offers a self-fabric collar & a double-needle stitched hem with tack. Free personalization is included on this design. Just simply enter any awareness, enter any name and choose our awareness color to be printed on this shirt. Met my expectations. For my children to wear for MS awareness. Very well done. Shirt is maybe a tad short for my liking though. Just what I wanted!! Served the purpose well. For my children to raise MS awareness. LOVE the fabric of this shirt. It's black but I stay cool and I love the feel of it next to my skin. The message is eye catching and I love spreading the word about ALS. I have so many of these MS Awareness shirts. I love the ones that are personalized as well as the others. I can't wait to see what will be next. I love my MS awareness shirt! Very pleased with this product! Additional Info Gather your crew and join the millions of people already showing their support in a cause that is close to their hearts with Awareness Apparel & Walk Gear from MyWalkGear.com. With this exclusive design, you can promote any awareness that means the most to you. You will also enjoy our Never Give Up Sports Performance Shirt as well.